ISLAMABAD: A non-human molecule found in red meat and milk makes its way into the human system when eaten -- and seems to build up especially in tumors, according to U.S. researchers report. The compound, called sialic acid, is found on the surfaces of animal cells but is not found in people, and may be one reason why animal-to-human organ and tissue transplants do not work well. Animals have a version called Neu5Gc, while humans carry Neu5Ac. But researchers at the University of California San Diego found it does show up in the human body, and showed it can be absorbed from eating red meat and milk. They also showed that the body produces an immune response against the molecule. Dr. Ajit Varki and colleagues, reporting in the Proceedings of the National Academy of Sciences, say it is too soon to make any recommendations based on their findings. "Of course, there are already existing recommendations that people should not consume too much food containing saturated fats, such as dairy products and red meats," Varki said in a statement. "The highest amount (of Neu5Gc) was found in lamb, pork, and beef (so-called 'red meat')," the researchers wrote. Levels were very low or undetectable in poultry and fish, vegetables and hen's eggs. Varki, who is not a vegetarian, noted that many studies have linked a diet rich in meat and milk with cancer, heart disease and other diseases. "The small amounts of Neu5Gc in normal tissues also raise the possibility that anti-Neu5Gc antibodies are involved in autoimmunity," the researchers said. Autoimmune disease occur when the body mistakenly attacks healthy tissue and include type-1 or juvenile diabetes and some types of arthritis. 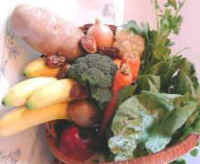 "In this regard, it is interesting that vegetarian diet has been suggested to improve rheumatoid arthritis," they wrote. But much research has focused on the fat content of animal fat or byproducts of cooking meat as the cause of disease. Varki's collaborator Dr. Elaine Muchmore developed an antibody -- an immune system targeting protein -- that would hook onto Neu5Gc. The team found Neu5Gc in human tumor samples and to a much lower degree in healthy tissue. More tests showed that most people had made their own antibodies that recognized Neu5Gc, and thus could potentially initiate an inflammatory immune response. Varki and two colleagues drank Neu5Gc purified from pork sources, and the molecule showed up in their urine, blood, hair and saliva. "We need to find out if there is any association between the presence of Neu5Gc and/or the anti-Neu5Gc antibodies with any disease," Varki said. "This will require large-scale population studies." In some cases the human immune response was similar to that seen when people are exposed to another animal molecule, this one a cell surface molecule called alpha galactose. Varki noted that the molecule is almost certainly not immediately toxic to people. "Meat eating has certainly been a feature of human ancestors for many hundreds of thousands of years," he said. "Thus, it is indeed possible that humans have developed some kind of tolerance or indifference to Neu5Gc. However, most humans are continuing to make antibodies against Neu5Gc." It could be that the damage only builds up over years -- and that as people live longer, the consequences make themselves felt. "However, we are now living longer and the question arises whether the gradual accumulation of Neu5Gc and the simultaneous presence of antibodies against could be involved in some diseases of later life," he said.